Muslim rulers were barbaric and they never showed love or affection towards public, women or slaves openly as they were afraid doing so would create an image of tolerant ruler among courtiers, and they might take ruler for granted. So to discuss their s*xual fantasies and dirty feelings; they took refuge of Badshahnamas; everyone had it right from humayu to aurangzeb. Akbar was barbaric and most hypocrite of all and he got the legacy of hypocrisy from Babur himself. The main reason for some of the homos*xual inclinations of mughal rulers can be rooted back to the concept of 72 virgins and pervert fun with young boys in heaven, as promised in koran after jihad (Virgins/s*x: 39, 69, 217, 221, 226, 237, 239, 350, 519, 541-2, 628). Even today, globally, Pathans of middle-east are ill-famous for being desperate male lovers and perverts of unnatural s*x. One of the popular Badshahnamas was Baburnama, it was written by the emperor Zahir Ud Din Babr who came from Uzbekistan to invade Hindustan (Bharat). It was in 1504, when he invaded through Kabul to Bharat (now India). Born in February of 1483, Zahir ud din Babur was one of the founder of Barbaric Mughal Empire. But little does the world know about the s*xual orientations of this anti-Hindu Mughal emperor. In his so called masterpiece Baburnama, Babur puts forward the story of his life as an autobiography. In Turks it was a common practice to keep male s*x slaves who were young children (Recently in Afghanistan children from the age range 8 to 14 years – mostly males – were rescued from child s*x racket by an NGO, it is the old practice that hardly cease to happen again). 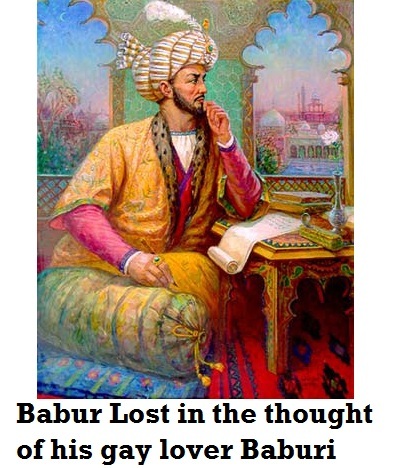 As Babur speaks in Baburnama, he was married at an early age of 17 to a lady Ayisheh Sultan Begum but he had started to lose all the interest in his wife or any other lady and the reason, not so shocking, was a young boy from the local camp market. 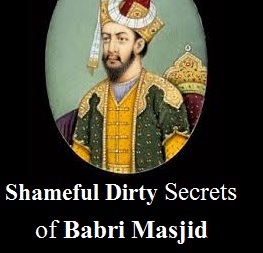 The homos*xual confession of Babur reveals it all. “During this time there was a boy from the camp market named Baburi,” he writes. “In the throes of love, in the foment of youth and madness, I wandered bareheaded and barefoot around the lanes and streets and through gardens and orchard, paying no attention to acquaintances and strangers, oblivious to self and others. When I fell in love I became mad and crazed. I knew not this to be part of loving beauties. Sometimes I went out alone like a madman to the hills and wilderness, sometimes I roamed through the orchards and lanes of town, neither walking nor sitting within my own volition, restless in going and staying. Now as we can see Babar was openly g*y and he would fantasize about young lads all his life. It was old practice of muslim ruler to demolish temples or renovate the existing structure and rename it on their lovers name. Some of the times, even if they do not name it on their lovers; their courtiers enact fabricated stories to keep the Hindu religious structure under captivity. But in case of Babur, it was then clearly the case of impressing his male lover and make him reciprocate the feelings while constructing a mosque in Baburi’s name. Some fanatic muslims argue that Babur was not g*y, did construct the Babri masjid but not in name of Baburi but in his name. They give logic as such: Baburi cannot become Babri. Their logic can be easily defied if that is so then Akbar could have constructed his tomb as Akbari or Aurangzeb as Aurangzebi. Their logic further falls flat as the name is Babri masjid which coincides with the name Baburi (pronounced almost in similar tone) and not Babur and even Baburnama clearly mentions that Babur was happy to have male lover with almost similar name. So, Babur becoming Babri is wrong but Baburi as Babri is factually correct. Even in Persian translation of Baburnama done by Akbar, the term Baburi Masjid was used twice. It confirms that Babri Masjid was symbol of homosexual love affair of Babur and Baburi. As per islam, homos*xuality is forbidden and sin; since it does not reproduce children so why muslims are so unhappy on demolition of symbol of homos*xuality, Babri Masjid ? The conductance of prayers in Babri Masjid never happened since the death of Babur – this fact might be known to the muslim public of that time and they abandoned the g*y structure pertinently. What is the reason of your anger, that he was gay or that he was a fanatic? And you know why these g@ys are hated by all. Its not because of their inclination but their evil traits. Google “haribhakt.com raas leela” to know truth of your question. So you mean to say being g@y is evil. How? If I’m a boy who likes boys, how does that affect you? Don’t you think Babur should be criticized because of his fanaticism and not s*xual orientation? [ …why these g@ys are hated by all ] – this is in context to g@y mughal rulers…THESE word was used, there is no judgement on anyone’s misnomers or identity or personal choice or intent. Do not get into petty arguments, making silly noises. You can go to such sites wherein you want to have EXPLICIT words and images used. This site is for haribhakts. taj mahal should also be archeologically revisited in similar legal manner and renamed Tejo Mahal with tombs removed . Yes, certainly it must be Sita temple there….nice job for archaeologist …which Islamic structure will be next in the list. This post will run into thousands of pages if all anti-Vedic structures that were created over Hindu monuments and temples are considered here. Because mlecchas (muslims) destroyed over 40,000 major temples, dharmic monuments across Bharat during their invasion to spread islamic terrorism in India. Reading Badshahnama threw light on shameful facts of muslim rulers. Really ashamed to be a muslim. We muslims have worst kind of past and present. Some of my friends and me would like to convert to Hinduism.